Fraternity elections are a huge deal, whether you’re running for chapter president or staying off the campaign trail and simply voting for a new social chairman. Elections will determine how your fraternity chapter is managed from top to bottom, and brothers hold the key to chapter success--or failure--in their hands, in the form of a ballot. You all know each other pretty well by the time elections roll around. 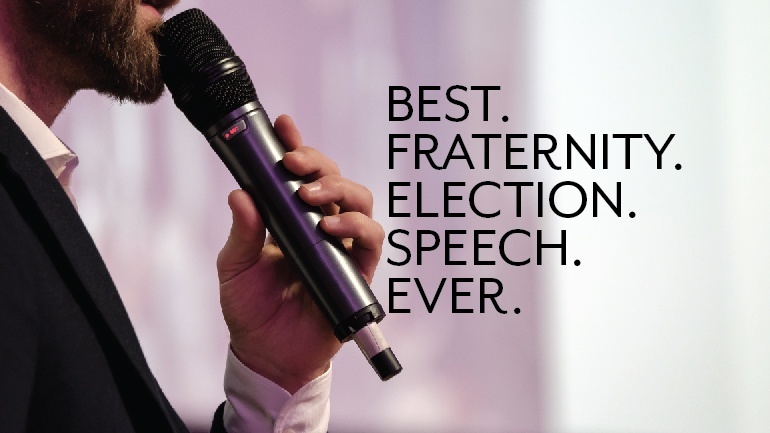 So, what’s the point of fraternity election speeches? Brothers spend a lot of time together, living in the chapter house and working toward chapter goals. However, whether or not Gregg is good at Ultimate Frisbee or likes the movie Old School as much as you do doesn’t really tell you much about whether, for instance, he’d be a good fraternity treasurer. You can probably glean from what you know of each other’s personalities how good a brother might be at a given role. For instance, if Kyle were really bad at talking to people, he probably wouldn’t make a good recruitment chairman. Still, fraternity election speeches are a way to wipe the slate clean. Everyone deserves a chance to start fresh. When you’re interviewing someone for a job, putting aside your prejudgments might lead to a surprisingly positive interaction and a new hire. The same is true with fraternity elections. So hear your brothers out, will ya? OmegaFi urges you to give these candidates their moment in the sun and a chance to share their ideas. You might just hear something that’ll change the course of your chapter and elevate you and your brothers to a whole new level in the semesters to come. You might get the privilege of listening to the Best. Fraternity. Election. Speech. Ever. In a Fastball Fraternity Election, How Do You Spot a Home Run Speech? Maybe it’s because it’s getting closer to October, but we seem to have baseball on the mind. Yet, you can definitely draw some parallels between what a fraternity election candidate is saying during his speech and how a batter approaches a pitch. For one, just as the batter can to some degree intuit where a pitch is going by the pitcher’s mechanics on the mound, a good fraternity election speech shows that the candidate sees potential challenges to his ideas and is prepared to adjust. You get some strikes in baseball and in life, but what matters is that you have the foresight to ultimately hit the ball, and hit it hard. Let’s put sports aside for a moment. The bottom line is that being a fraternity officer takes endurance and some level of aptitude, but more importantly it takes practice, patience and a bit of luck. And there will always be challenges and setbacks, and, yes, there will be failures along the way. That’s true not only for the fraternity president, but for all positions up and down the board. If a candidate can convey how he’ll face those challenges and be better for it, you’ve got yourself a great fraternity election speech. Let’s give another fictional example here: Rob is running for recruitment chairman. It’s time for him to give his speech. He talks about how many friends he has from his days in the dorms, how he’s on the men’s soccer team and super popular with fans. He’s on Facebook practically all day, every day, so he’s great at networking and drawing a crowd to your chapter on the internet. Plus he’s pretty easy on the eyes, if he does say so himself. He’s a bro’s bro, and that attracts guys like him to the chapter at recruitment events. But . . . do you really want a chapter full of guys like Rob? No offense to our make-believe brother here, but this election has really brought out the vanity in him. In fact, all you heard the whole time was about how Rob is cool, has friends and is good looking. But being super thirsty for attention isn’t what makes a good recruitment chairman. You know practically nothing about how he’ll perform the job, except that he’ll probably turn off potential new members by talking about himself the whole time. If Rob had focused his election speech on how he’ll fulfill the job description of the position he’s running for, and in turn how electing him will benefit fraternity chapter itself, brothers would then be able to make a much more accurate assessment of his qualifications. Confidence and experience are important, don’t get us wrong. But don’t elect a brother who uses his speech as an opportunity to show off, rather than talking about how he’ll show up and do the job. Fraternity election speeches are, in some ways, saying what brothers want to hear. But on the other hand, it’s important for a candidate to anchor his speech in reality, and sometimes the reality isn’t all sunshine and rainbows. For instance, let’s go back to Rob for a moment. Rob knows recruitment has been on a downward trend the past few years. The chapter isn’t keeping pace with the numbers of other fraternities on Greek Row. But he doesn’t point the finger at the outgoing recruitment chair or any of the other candidates running. He takes his part of the chapter-wide blame, and pledges to work on solving the problem. He can’t promise an unrealistic recruiting goal, even if that goal is desperately needed, but he can lay out the basic steps of his plan to reverse the negative trend. Brothers don’t necessarily like hearing that things are going to still be not-so-great for a while longer, but deep down they already know that and will appreciate the pragmatism and honesty. The best fraternity election speeches offer what others don’t: realistic, honest ideas. Have you ever heard a speech that you thought was the Best Fraternity Election Speech Ever? Let us know in the comments below what stood out to you.